Description: In this Girls Fix It game we're going to take care of a magical creature! Crystal's Dragon got injured by and she needs you to clean him, bandage his wounds and heal him with a magic potion, and feed him. 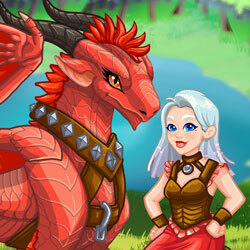 Next, you can play dress up with Crystal and design your dream dragon!